The staff at Foley Squash was up early preparing for the Cactus Classic 2016 final. Players had been remarking all week about the quality of the court. A big thanks go out to David Carr and his crew at McWil for their skill and craftsmanship in building a superb product. As Omar Abdel Meguid and Todd Harrity were warming up, there was an obvious feeling that the mojo in the crowd was firmly behind the #1 US player Harrity. Play began with Omar taking the first three points. Not a good start for the US. Meguid took the first game 11-7. The second held hope for the biased spectators, when the game was tied at 10-10. Meguid was too strong and took the next two points, giving him a commanding 2-0 lead. Harrity slowed the pace in the third with some well placed lobs and was off to a 5-1 start. Todd kept the US hopes alive winning 11-9. Mequid, however, was not to be denied. 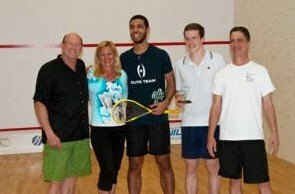 Harrity was no match for the big Egyptian, and fell quickly giving Omar Meguid his third 15K title in a row. 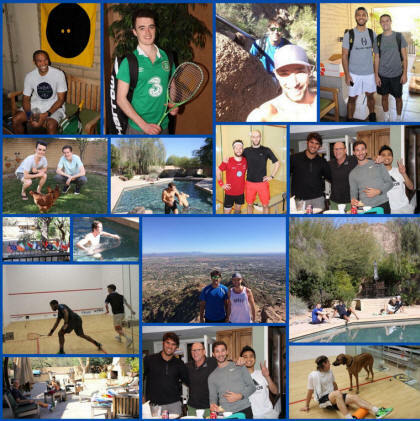 Dohar Qatar, Portland Oregon, and now Phoenix Arizona! Well played, and congratulations to Omar. We look for big things from him on tour. Long week, but loads of fun for all involved. Thanks to all of the players for keeping us entertained throughout the event. Thanks to all of the donors, especially Dr Jim Ganem for stepping up to make this event happen. Most of all thanks to my wife and surrogate tour mother, "Saint" Betsy for helping and being there every step of the way! Until next year, we are signing out from the desert. Omar Abdel Meguid faltered early loosing the first game to Mahesh Mangoankar. Omar was able to tighten things up and quicken the pace and in spite of the gamesmanship on both sides Meguid was able to extinguish Mahesh's fire. It was Omar Abdel Meguid over Mahesh Mangoankar 3-1. Omar, as a fellow dentist, congratulations on your win but tomorrow my patriotic pride puts me in the corner of the winner of the next match. Yes, the next match put US # 1 Todd Harrity into the finals. Todd showed great resolve and was able to answer everything the young kid from Qatar, Abdulla Mohd Al Tamimi, threw at him. 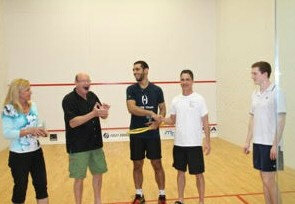 The final result had Todd Harrity winning in a tightly contested match, 3-2 over Abdulla. The stage is set for a US vs Egypt final. Although I have great respect for Omar Abdel Meguid and wish him well, I must toss my hat into Todd Harrity's ring. Go USA! Sleep well gentlemen and best of luck tomorrow. 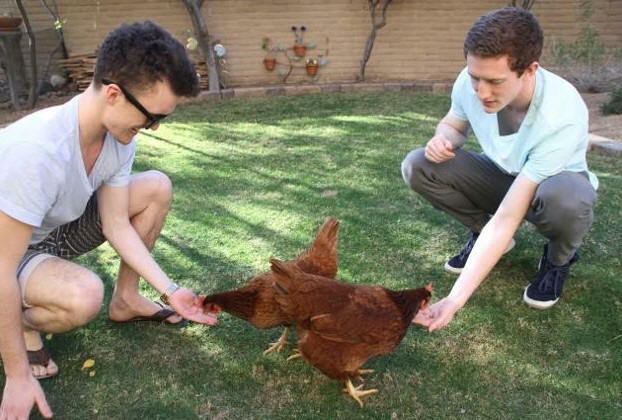 Two men will enter and only one will leave. Party time for me. Boring but oh well, sunny and 86F tomorrow. The crowd was gathering and a buzz was in the air with the knowledge that there will be one US player in the semifinals. Everyone was anxious to see how the matches played out. Two questions remained to be answered. Would there be a rematch of Oregon where Omar Abdel Meguid met fellow countryman Karim Ali Fathi in the final, and which US player would make it through to the semifinals? The first match answered half of the first question when Omar Abdel Meguid defeated Reiko Peter relatively easy, 3-0 keeping his chances to appear in the final intact. Again the size and quickness of Meguid proved too much for Peter. Next up the audience witnessed a close match up between number 4 seed Henrik Mustonen and number 5 seed Mahesh Mangoankar. As expected the equal pairing resulted in a give and take confrontation lasting 75 minutes. In the end Mangoankar found himself spent but victorious over Mustonen 3-2. The second question of the day would be answered in the next match. Two US players being coached by two Australian coaches. Todd Harrity was under the wing of his billet and former PSA player, Peter Fantich. Chris Hanson had Geoff Hunt in his corner. Chris found himself sitting comfortably up 2-0 love tasting victory. In a reversal of the previous night when Hanson came from 0-2 down to defeat Peter Creed, the tables were turned. Harrity was able to dig deep, change a few tactics, and in the end it was Harrity 3-2 over Hanson. Todd Harrity has gained his place in the semifinals. and showed tremendous movement and shot making abilities, winning the next 3 games. There would be no all Egyptian rematch. Abdulla Al Tamimi besting Karim Ali Fathi 3-1. Questions are answered, the draw is filled, court lights are off, and yes it will be sunny and 84F tomorrow. Good night from the desert! A good day for the US boys winning 2 out of three. As usual, the day was spent with fun and sun, match preparation, and even some pickleball. As the crowd settled for the first match of the day, there allegiance was split. Would their national pride put them in USA Todd Harrity's corner, or behind our new young Canadian friend David Baillargeon. David started quickly and strong taking the first game 11-7. With a change of tactics, Harrity was able to even the match with an 11-9 win in the second. The final two games were all Harrity, giving the USA our first victory in the Cactus Classic 2016. US hopes remained alive when Chris Hanson (USA) met Peter Creed (WAL). Creed ranked 74 and Hanson 75 were expected to have a very competitive match, and this proved to be the case. Creed weakening and the match was even at 2 all. Peter and Chris traded punches in a 27 minute final game ending with USA on top again and Hanson winning 14-12. Next up, Abdulla Mohd Al Tamimi quickly dispatched qualifier Valentino Bon Jovi Bong winning easily 3-0. On a side note Bon Jovi Bong (the best name on the tour) was displeased that he was not given a nickname in previous reports. After careful consideration and given his unique hairstyle, it has been proposed that he be nicknamed "The Skunk". Will it stick? 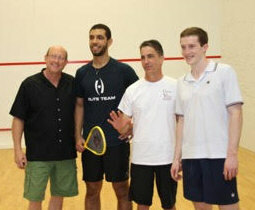 The final match had the final US player of the day, wildcard Faraz Kahn meeting the number 2 seed Karim Ali Fathi (EGY). Although Faraz played well he was outmatched by Ali Fathi and lost 0-3. Two US boys through to the quarterfinals is a great result for the day. Well done Todd and Chris! Sleep well and make us proud tomorrow lads. Forecast for Friday is 84/50F. Yes, you should be jealous. Good night from the desert. The near capacity crowd was once again treated to some quality squash. There were no surprises tonight, and everything played out as expected. 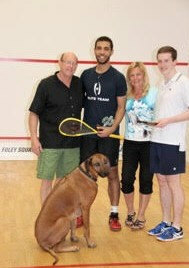 With his size dominating the court, Omar Abdel Meguid won handily over Jaymie Haycocks 3-0. 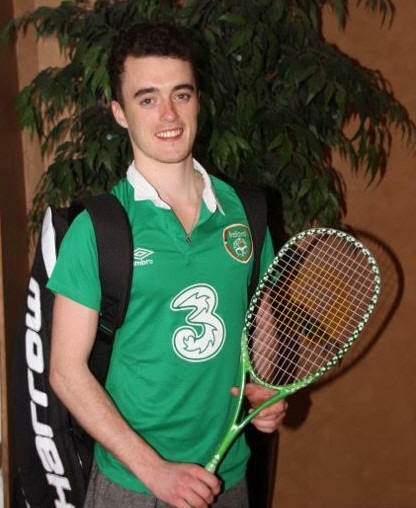 Although playing well through the qualifiers Sean "Speedy Gonzales" Conroy was unable to make a dent in Reiko Peter's armor and was quickly dispatched 3-0. The referee was kept busy making 34 decisions in an extended match that found India's Mahesh Mangaonkar prevailing over Egyptian Karim El Hammamy 3-1. Qualifier Clinton Leeuw had a strong showing against Henrik Mustonen, but in the end lost 1-3. The next half of the first round will start tomorrow opening with the US favorite Todd Harrity against newly adopted "local" Canadian David Bailargeon. Two other US contenders, Chris Hanson and Faraz Kahn have their hopes set on a spot in the quarter finals. One thing will be certain and that is the sun will come up and shine brightly over Phoenix. Forecast is sunny and 84F. Another bluebird day in Phoenix. The official high was 84F/29C, although the gauge in my truck reached 89F while collecting supplies keeping the boys in food and drink. 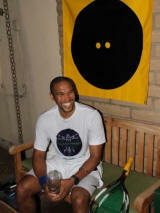 One of the players was overheard saying he was loosing on court but was having so much fun that he did not care. Sounds like a good tournament to me. After the day of practice, the court was spotless and ready for the qualifying finals. Play began with Joe Chapman facing Valentino Bong. Chapman did not seem to be playing his best and Bong was sharp winning 3-0 in 34 minutes. Next up was Sean "Speedy Gonzales" Conroy versus Reuben "Slugger" Phillips. The crowd was entertained with the power of Phillips and the retrieval ability of Conroy. Sean seemed to have an answer for everything that Reuben threw at him, and was able to win 3-2 with the final two games ending in 12-10 tiebreakers. Tiebreakers were the order of the evening. The next match ended with two games scores of 14-12 and 13-11 finding Clinton Leeuw beating Mark Broekman 3-0. Whatever brilliance Broekman exhibited the night before seemed to have eluded him this evening. 1-11 in the fourth. The seesaw game five was marred by some questionable decisions by the referee. With the crowd rallying behind the young Canadian, Baillargeon was able to win the game 12-10, sending him in to a spot in the main draw where he faces the number one USA player Todd Harrity. Players and patrons snuggled away while I struggle to finish this and sleep before my 7 AM patient in the morning. The forecast for tomorrow is 86/51F. Good night from the desert! 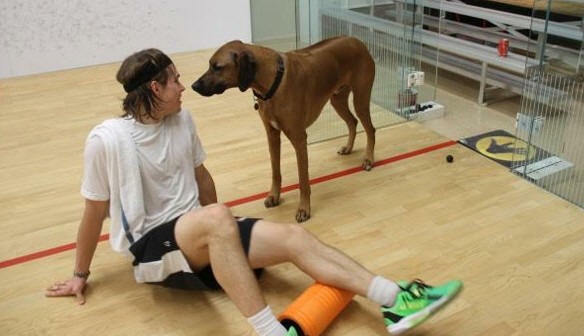 The PSA World Tour returns to the Foley Squash Pavilion after a 5 year hiatus. This is one of the unique venues on the Tour, a single court in a private home situated at the base or scenic Camelback Mountain in Phoenix Arizona. Record crowds of 200,000 people attended the Phoenix Open golf tournament this last Saturday, and a few of them stuck around to witness the opening round of the Ganem Vein Institute Cactus Classic 2016. 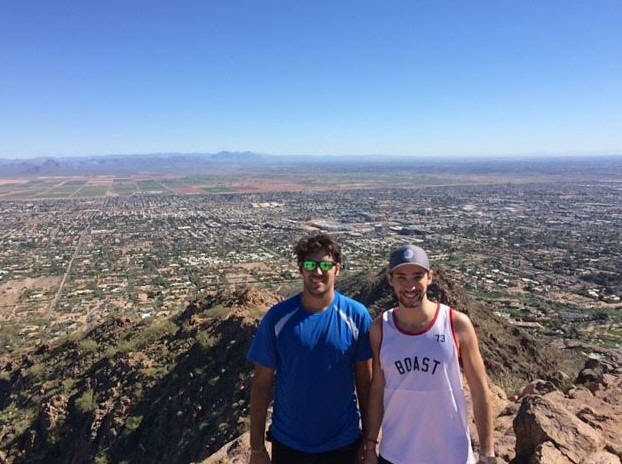 Beautiful day for squash or just about anything in Phoenix today. The high was 83 degrees with more of the same forecast for the entire week. Before play began, the players could be found relaxing and lounging poolside. Some of the more adventurous lads went for a swim only to discover that an unheated pool in the middle of the winter in the desert is very similar to a cold plunge. Not many braved it for very long. Match play began with number one seed Joe Chapman defeating one of our USA hopefuls, Sam Gould 3-0. 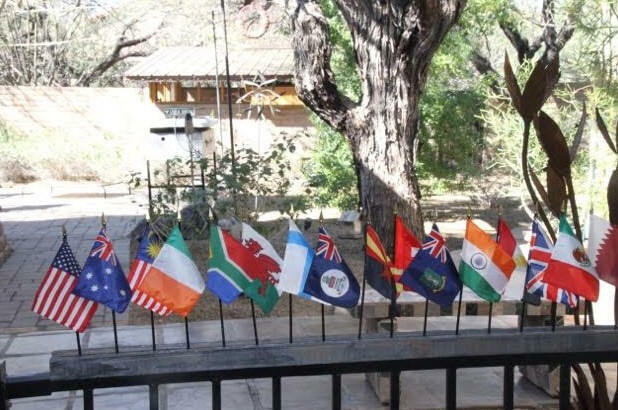 Although Sam fought to a tiebreak in the second game, losing 12-10, he was not able to overcome his tougher opponent from the British Virgin Islands. The second match found Malaysian Valentino Bon Jovi Bong (one of the all time great tour names) defeating Mauricio Sanchez 3-0 in close battle that lasted 46 minutes. 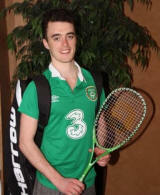 Next up found the quick and feisty Irishman, Sean Conroy defeating Charlie Johnson 3-1. After an easy first game winning 11-5, Charlie seemed unable to figure out Sean's new tactics and lost the next three games. Match number four was Jean-Pierre Britts versus Reuben Phillips. Britts was in fine form after a week of training with David Palmer in Orlando, but Reuben proved that Jean-Pierre still has some work to do, winning 3-0. The second half of the draw began with Mark Broekman soundly beating the number 3 seed, Cameron Stafford 3-0 in 24 minutes. With both "big boys" on court, it was tight quarters. Next, one of our locals, Heraclio "Lakko" Salaiz was matched against a very strong Clinton Leeuw and lost 3-0. Match 3 pitted David Baillargeon against Juan Gomez. The Canadian was moving very strong and smooth beating Juan 3-0. The premier match of the evening featured our local favorite, Australian and former PSA player, Peter Fantich playing the number 2 seed Addeen Idrakie. The much older, wiser, and possibly less fit Fantich extended the first game to an amazing 10 minutes and surprised the young Idrakie taking it 11-9. Although old Peter fought hard, it was not meant to be, and he staggered off court unassisted losing 3-1 in 40 minutes. A massage is in order tomorrow mate, and no lessons juniors! Good night from the desert. Forecast is high of 80 with a low of 50 tomorrow.